Talk about “Clockwork Angels.” Playing for perhaps the last time in Northern California, Rush took more than 10,000 fans on a celestial journey through time at San Jose’s SAP Center on July 23, celebrating the band’s 40-year run. Playing songs from the recent “The Anarchist” to eternal classics “YYZ” and “Working Man,” the Canadian rock trio pleased younger listeners who met the band through MP3s and exhilarated older audience members who latched on in the days of eight-track tapes. Clearly, Rush wasn’t confined to the stage in San Jose. The band’s thunderous performance injected a rush into fans throughout the building. That’s been the trio’s standard procedure since at least 1974, when percussionist Neal Peart joined the group. The “new guy” showed why he’s widely regarded as the greatest drummer in rock history, beating his tom toms and cymbals in a flurry of perfectly-timed motion and sound. Guitarist Alex Lifeson shredded tune after tune with precision and every solo with feeling and flair. And Geddy Lee hit all the low notes with his bass and impossibly high ones with his voice while engaging an enthralled audience with his wildly dynamic expressions and eyebrows. Now in their early 60s, the three men played with the boundless energy of musicians half their age on favorites such as “Animate,” “Distant Early Warning” and “The Spirit of Radio.” In so doing they showcased the spectrum of styles that Rush has mastered over the decades: hard rock, progressive rock, new wave and even a little reggae. 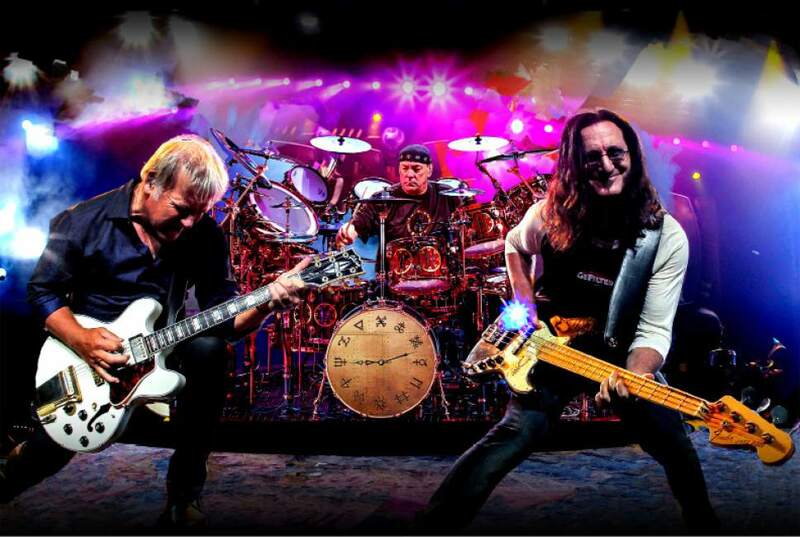 Health concerns – Lifeson’s arthritis and Peart’s tendonitis – have led band members to hint that the current “R40” tour may be their last, but haven’t yet perceptibly diminished their performances. There are about “2112” reasons why Rush wasn’t always considered cool, starting with the gender breakdown of the fan base. Lines outside the men’s rooms far exceeded those outside the women’s rooms at this and every other performance in memory. Movies like “Fanboys” taunted the trio’s followers as hopeless nerds. Critics and the press slammed the band for decades, mocking Lee’s “freakish” voice and Peart’s sci-fi inspired lyrics. Rush finally won that argument, winning induction to the Rock and Roll Hall of Fame in 2013. Unwavering fan support carried “the world’s most popular cult band” through all its adversity, the musicians have said. “Thanks for coming out for more than 40 years,” Lee told the audience warmly.